This chart depicts the planned trail route for Dr. Laurence Gould's famous sledge trip to the base of the Transantarctic Mountains during Admiral Richard Byrd's first Antarctic expedition in 1928-30. The front of the chart contains various notes about the condition of the ice at points along the trail. It also includes approximate flight times from Little America 1 to points along the trail and the conditions for landing. Approximate compass bearings are noted at intervals (the South Magnetic Pole is far from the South Geographic Pole). Also note that the chart is signed by both Admiral Byrd and Dr. Gould. Joseph DeGanahl was a navigator, dog driver and backup pilot for the expedition and was on the supporting party that laid food and fuel depots for the 1500-mile dog sledge trip in 1929. 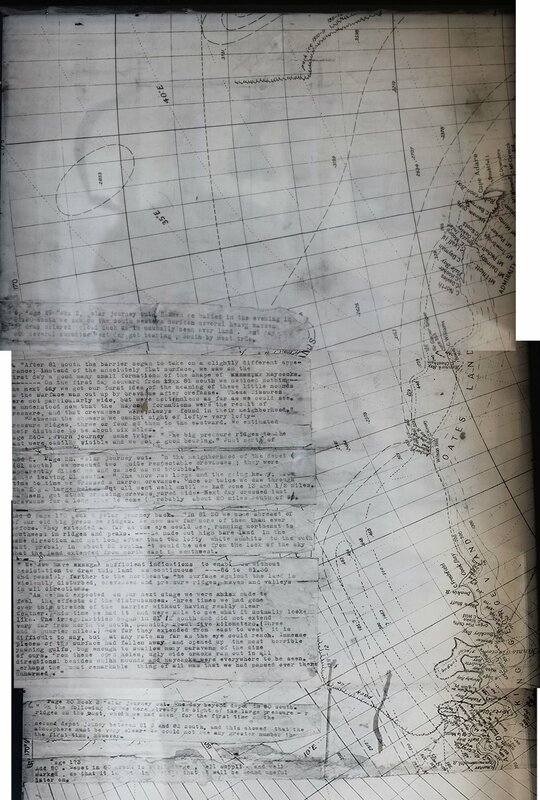 The back side of the chart contains comments on the trail condition after 81 degrees south, presumably assembled by DeGanahl from notes by Roald Amundsen on his 1911 journey to the Pole. Dr. Gould took the same route to the base of the Axel Heiberg Glacier. We are grateful to DeGanahl's grandson, George Russell, for allowing us to use these images.